Archival community - as far as I know - looks at standards and automation with some kind of hesitation. Such situation was very well described by Professor Peter Horsman on the European Union Archive Network (EUAN) web site [Peter Horsman, Metadata and Archival Description, http://www.euan.org/euan_meta.html]. He hoped that old motto: "my archives are unique" is going to be the past. I remember my own experience with the first Polish translation of the General International Standard Archival Description - ISAD(G) in 1995. Translation of the second version of ISAD(G), which had just been finished, was done in a different climate. Similar attitude of hesitation could be noticed towards the Encoded Archival Description (EAD). My own personal reaction, when for the first time I saw the template in SGML, was borrowed from the film for children "Bob the Builder": "Can we fix it?" In this film the answer is: "Yes, we can!" and it is a real answer - "we can". First of all I would like to express my thanks and acknowledge my debt to many colleges archivists, who helped me on my road to EAD. I wonder, or even doubt, if one could do it alone. With the goodwill and help of the President of Polish State Archives I had a chance to exchange opinions on EAD with Swedish, German, Dutch and English archivists. During my four days studying visit in the Archievschool in Amsterdam Professor Peter Horsman told me to start encoding, even on paper: "Just do it, You must feel it." Perfect and profound advice. These four days helped me a lot. You can not understand this structure without doing it by your own hands, putting tags in proper order and filling in data between them into the template. Professor Daniel Pitti, whom I never met so far, patiently answered my successive questions and problems with e-mails of suggestions, corrections and advices. William Stockting suggested to translate "RLG best practice guidelines for Encoded Archival Description", which I have done [Wskazówki dotyczące "dobrych praktyk" przy wdrażaniu EAD opracowane przez grupę doradczą RLG, s. 77-100, in: Archiwa w postaci cyfrowej. Standaryzacja. Od ISAD(G) do EAD. Materiały międzynarodowych warsztatów Delos CEE [Proceedings of the International Delos CEE Workshop "Standardization. From ISAD(G) to EAD. Implementation and Best Practice"], pod. red. E. Rosowskiej, Warszawa 2003]. In our "perfect" archival world, in repositories, we keep not only records (as our holdings), but finding aids as well, to know what these records are about. Nowadays these finding aids (inventories, registers. etc.) and of course archival holdings, should be easily accessible for all. Inventories should be presented in electronic format on the web, to guarantee easy access to records. Descriptive information is a key to the holdings. Without inventories access, which is right now one of the most important issue for archives, would be not possible [Angelika Menne-Haritz, Access - the reformulation of an archival paradigm, Archival Science, no. 1, 2001, pp. 5782; Polish translation in Archieon no 104, 2002, pp 68-95]. "EAD is the first data structure standard to facilitate distribution via Internet of detailed information about archival collections and fonds" - as one could read in the preface to the Application guidelines to EAD (1999). This is what EAD is for. In my Polish "perfect" archival world, only a small fraction of existing finding aids is till now in electronic format. I hope - and in this point I am rather optimistic - it is around 15% of all our inventories. The rest still has to be put into electronic format - we call it retrospective conversion. And once again: EAD is just for such activities. Speaking of standards in electronic environment, sooner or later, will mean - metadata. The term had been familiar in librarians' world, but in the first half of the last decade of the 20th century it was rather something new for archivists. 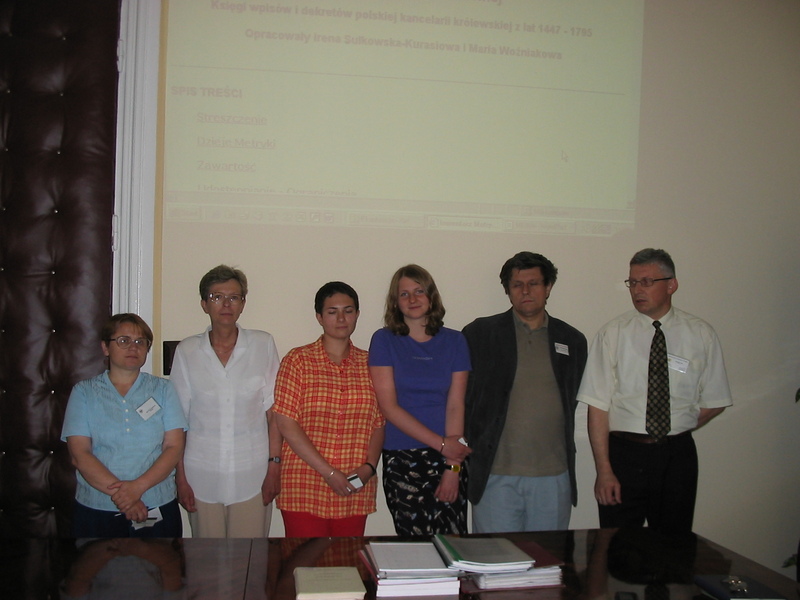 In 2000 Poland held a conference on metadata; around 50 archivists, who were interested in electronic records, descriptive standards etc., discussed, what had been done by others - EUAN, EAD, CEDARS etc. The next symposium, a month later, was dedicated to EAD - Professor Peter Horsman told us about his ideas (pro et contra) in "EAD - Magic word or terror?" Spring on past year we had two conferences (one domestic and the other one international) on EAD, in the framework of "Delos" project. The papers were published both in paper and in electronic formats on the website [On the web site of Central Archives of Historical Records - http://www.archiwa.gov.pl/agad/ead/ead.html; see also footnote 2 - Proceedings of the International Delos CEE Workshop]. This was a theoretical base and background for further application. I think some theory and conceptual work is needed for a good start. The introduction of ISAD(G) in 1995 as a schema for description in Central Archives of Historical Records (my workplace) was also very useful and helpful. Crown Chancery Public Register (Metrica Regni) - very important historical fonds, with typical structure (series, files [books], and items) and detailed modern inventory [Inwentarz Metryki Koronnej, Księgi wpisów i dekretów polskiej kancelarii królewskiej z lat 1447 - 1795, Opracowały Irena Sułkowska-Kurasiowa i Maria Woźniakowa, Warszwa 1973], was chosen for the first, pilot project. The rights and privileges granted by Polish kings' were recorded - probably from the end of the 14th century - in the books of Crown Chancery Public Register. The oldest, existing till now books, from the series of registrations (Libri Inscriptionum,/i>), began in the middle of the 15th century; the series was continued till the fall of Polish Republic at the very end of the 18th century. In these books were written down copies of all important kings' charters of permanent value like: donation of estates and landed properties, nominations for offices, military ranks, etc. There are also highly detailed registers for each record - abstract or brief notes, describing what each and singular record refers - to the earliest part of that series: from second half of the 15th till 70s. of the 16th century. These registers or "summaria" - Matricularum Regni Poloniae Summaria - were systematically edited within the space of the last century [Matricularum Regni Poloniae Summaria, ed. T Wierzbowski and others, vol. I - VI, Warszawa 1905 - 1999]. Another series, gathering diplomatic records  from the beginning of the 16th century - is called: legations (Libri Legationum). In the 17th century Chancery began series for registration of records, which were sealed in Crown Chancery (Sigillata) and in the 18th century other books for Chancellery records issued by Chancellors. The fonds contain also the records (books) of kings' courts of justice; however, this part was hardly destroyed during the 2nd WW. The language of the majority of the books (and records) - might be, except the 18th century - was Latin, but there were also records in Polish, German and Old Ruthenian. There are 790 books in all series, in registrations - 361 books. Only for the first half of the 16th century there are about 30 thousands records in 90 books. Because of its' great historical value, archival structure and existing finding aids, Metrica Regni was chosen for the pilot project to introduce EAD. The project was started in the fall of 2003. The first idea was simply to rewrite the existing inventory partly into a MS/Word editor and partly into MS/Access database - at the series and file (book) levels; wrappers: <c01 level = "series"> and <c02 level = "file">. The general information on the series level was rewritten into MS/Word editor and using paste/copy put inside the wrappers: <scopecontent>, <bioghist>, <bibliography> etc. In the same way the introduction to the whole fonds was rewritten and put inside the <archdes> wrapper. The table presents the way of conversion from the database into xml file for the file (book) level. Table 1. EAD - ISAD - Database for <c02 level="file"> - ISAD 3.1.4.
it is changed on <unitid type="former">] ISAD 3.1.1 Note Dawne sygn. The input of data was partly done in the Central Archives of Historical Records by a staff person (Ms. Katarzyna Janowska-Kucio), partly by a person sent by the labour office, during her half year practice in the Archives (Ms. Aleksandra Siwek) also in some part by students from one of the high schools in Warsaw (ZNP). The most important part of the task - proofreading, checking of accuracy and correction of errors was done by archivists: Ms. Urszula Kacperczyk, Mr. Michał Kulecki, Ms. Inga Stembrowicz and myself (foto of our team). At the beginning of the year 2004 it was possible to add highly detailed, lower level - item - abstracts of the single records, as wrapper, for the oldest books from the 15th century. These books and records are in Latin. The input of that data was done by a person sent by the labour office (Mr. Witold Poletyło). Central Archives of Historical Records began cooperation with the seminar of Professor Wojciech Krawczuk and his students from Jagiellon University in Krakow, who is actually the leading specialist in the field of kings' chancery of modern times [W. Krawczuk, Metryka Koronna za Zygmunta III Wazy, Kraków 1995; W. Krawczuk, Metrykanci koronni. Rozwój registratury centralnej od XVI do XVIII wieku, Kraków 2002; Księga wpisów podkanclerzego Tomasza Zamoyskiego z lat 1628 - 1635, opr. W. Krawczuk, Sumariusz Metryki Koronnej. Seria Nowa, t. I, Kraków 1999; Księga wpisów kanclerza Jana Zamoyskiego MK 133 z Archiwum Głównego Akt Dawnych w Warszawie z lat 1587 - 1595, opr. A. Kot, W. Krawczuk, M. Kulecki, A. Sokół, G. Spyrka, Sumariusz Metryki Koronnej. Seria Nowa, t. II, Kraków 2001]. He also published registers for three 17th century books; his abstracts were written in Polish. We hope to broaden this cooperation into a collaborative grant project. "Quite easy" - because they are in printed format - we could apply around 42 thousands abstracts. Money is the only missing elements. It is also possible to add digitized images of the original pages of the books into EAD description. This idea, though very interesting, needs much more money, work (scanning from black and white microfilms), hardware (disc space) and software (browsers). Examples of such undertaking - based on the chosen book Metrica Regni 16 (MK 16) - will be available soon on the web: Polish Internet Library. Regarding technical side of the project, the most important factor is the web site of the Library of Congress dedicated to EAD [Web site of Library of Congress - http://www.loc.gov/ead/ead.html]. One could find there and download basic information needed to work with EAD project. You could download DTD instance for the 2nd version (version 2002) of EAD; use examples and tag library to consult your structure (template). Two eminent works of Michel J. Fox are there: "Cookbook" and stylesheets (for the 1st version). These stylesheets, with slight amendments, could cooperate with the 2nd version. The way of presentation depends on your ideas and could be achieved in different ways (also: Cascading Style Sheets or HTML). After visiting Library of Congress web site dedicated to EAD all one needs to build a template is an XML editor. One of the recommended products is XMetaL; however, for my archival institution it is a bit too expensive. I use Polish HTML editor - "Pajączek" (Little Spider). It could read XML tags as well. The next step, having already all these mentioned above: DTD from the Library of Congress web site and editor, was input of (structured) data. The data could be extracted from an MS/Access database directly into an EAD template, if it is structured according to ISAD(G) (see table 1). The data from MS/Access database were exported into xml file automatically. Some changes were done before export - names of the fields in database were taken from EAD, to have EAD tags after conversion, other in HTML editor (putting <p> after <scopecontent> etc. using Find/Replace function). It depends on the structure of the fonds, as it is foreseen in EAD, which wrapper will be adopted for which level of description; in this project wrapper <c01> was for series, wrapper <c02> for file (book) and wrapper <c03> for item (abstract). In this project we were happy to have general descriptive information, but in other retrospective conversion activities one could be faced with the lack of them and it will be real problem. Date and structure were corrected and checked during all these steps. When an xml file was ready, it needed to be validated against the EAD DTD. I use - thanks to Professor Pitti's suggestion - free ware xmlvalid by Elcel Technology Ltd. It is an MS/DOS product. After series of validations and corrections, the last thing to be done was presentation. I used - with small changes - Mr. Fox's stylesheet as a delivery method. On the 29th July 2004 the inventory of Crown Chancery Public Register in EAD was visible on the web site of Central Archives of Historical Records [Web site of Central Archives of Historical Records - http://www.archiwa.gov.pl/agad/pomoce/MKINw.xml]. It was an xml file with an xsl stylesheet; There are no search engines or any other indexing tools so far. The first inventory in EAD is already done, of course it will need a lot of additional work, the other finding aids will be soon presented, however important question remains: "are we ready for EAD? ", especially for retrospective conversion? From the point of view of technology I think: Yes, we are. Of course the tools like XMetaL or XMLSpy, programs for automation of conversion from database to EAD template and from template to HTML would be helpful. As for the archival side, two important questions have to be answered: do we have legacy inventories shaped and structured in the way, which let us put them into EAD template and do we have staff able to work on it? Here one could adopt a solution from British National Archives (former Public Records Office) - a small group working on EAD for all archives in A2A project [A2A. Access to Archives. Report, April 2000  March 2002, A2A Central Team, PRO 2002]. As to the first question, I am really not sure - with all the respect to what they had done - did the former generations of archivists left us legacy, which without hard work could be encoded according to EAD standards. Old descriptive practice did not include many basic elements that are essential to a proper finding aid and were not as standardized as they are now thanks to ISAD(G). During many decades archival way of thinking was like mentioned above motto: "my archives are unique", unifying these unique "universes" seems like very real challenge and job: "Can we fix it?"